Prostate Advantage® / 180 softgels - Nature's Way®. Take 2 softgels twice daily. If taking any medications, consult a healthcare professional before using this product. Not intended for use by pregnant or nursing women. 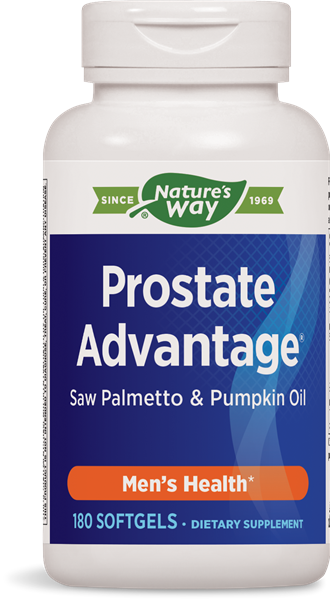 Why should I take Prostate Advantage® instead of just saw palmetto? Can I take Prostate Advantage® long term? Yes. We are unaware of any adverse health effects from long-term use. All of the ingredients have long histories of effective use. Why was pygeum removed from the prostate formulas in the Schwabe North America products? And is the new ingredient, phytosterol complex, comparable to the former pygeum ingredient? Pygeum (Prunus Africana) is classified as an endangered plant species and there is concern over its long-term availability. Schwabe North America (SNA) is committed to the stewardship and sustainability of those plant species in danger of becoming extinct. Therefore, SNA has decided to reformulate the prostate formulas in the Enzymatic Therapy and Nature’s Way product lines replacing pygeum with a phytosterol complex standardized to contain 15 mg sterols and 10 mg beta-sitosterol per two softgel capsules. The phytosterol material is actually richer in sterols and beta-sitosterol than the pygeum material which contributed 7.2 mg sterols and 4.8 mg beta-sitosterol per two softgel capsules. Phytosterols and beta-sitosterol, a specific plant sterol, are derived from various plant sources. These sterols have been shown to support prostate health. * Since sterols and beta-sitosterol are the major active constituents in pygeum, the phytosterol complex standardized to contain both of these constituents is the appropriate substitute in the prostate formulas. * This statement has not been evaluated by the Food & Drug Administration. This product is not intended to diagnose, treat, cure, or prevent any disease. Multivitamin with nutrients especially for the needs of men age 50 and older. Multivitamin formula with essential nutrients formulated for men.